Mia Welch danced to a video game while at Mayo Clinic Hospital awaiting a transplant. For months, a constant beat filled Mia Welch's room at Mayo Clinic Hospital in Arizona. But it didn't come from a radio or MP3 player. It was the beat of an artificial heart that was keeping Mia alive. Mia's troubles began right after she was accepted into the Mesa Community College Dance Company. First, she started experiencing fatigue and shortness of breath when dancing. Then she began having difficulty just doing day-to-day activities. She scheduled an appointment with a doctor in Phoenix. And it soon became clear that something was seriously wrong. 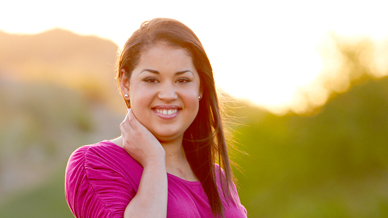 "When the doctor pulled the chair up, I knew it was bad," Mia told the East Valley Tribune. "He said, 'You have congestive heart failure,' and my whole world felt like it flipped over." Mia's doctors put her on medication, hoping that her heart would heal on its own. Instead, her heart grew weaker. She was then referred to Mayo Clinic and placed on the transplant list. Eventually, it became clear that in order to survive long enough to receive a transplant, she would need an artificial heart. In November 2011, Mia received that heart — a 400-pound machine dubbed "Big Blue" that she was tethered to 24 hours a day. Before Christmas, her doctors replaced Big Blue with a device small enough to fit in a backpack. The transition came with a newfound mobility, and Mia made plans to attend her former dance company's spring performance, Heartfelt, which they had dedicated to her. But she never got the chance. On March 17, just days before the performance, Mia received a new heart. She is doing well after transplant surgery, which brings her one step closer to her goal of returning to the stage. "I will be able to," she says. "I know it. I'll be dancing again."